Here is very strange eBay sale, winning bid-wise. A very common issue in my opinion. Bookery has nothing special written on it, listing it as “fairly common” and priced at $4.00 – $10.00 – $20.00. (I picked up a copy of this issue at the most recent 2016 PULPFEST for $5.00 (!!!) in ten times better shape, so where’s that bidder who lost, HaHa). “Free Range,” the ‘Jim Hatfield’ story, is by the prolific Tom Curry, who wrote at least 61 of the 206 Hatfield tales. The short story “Battle of Giants” is by the prolific Chuck Martin. There is no Robert E. Howard (who was gone by this time anyway) or L. Ron Hubbard’s so why the high bidding price? (The Nov. 1949 issue has the 6 or 7 page short story “Man for Breakfast” by L. Ron Hubbard (written as by W. R. Colt) and this list at $20.00 – $5.00 – $100.00). 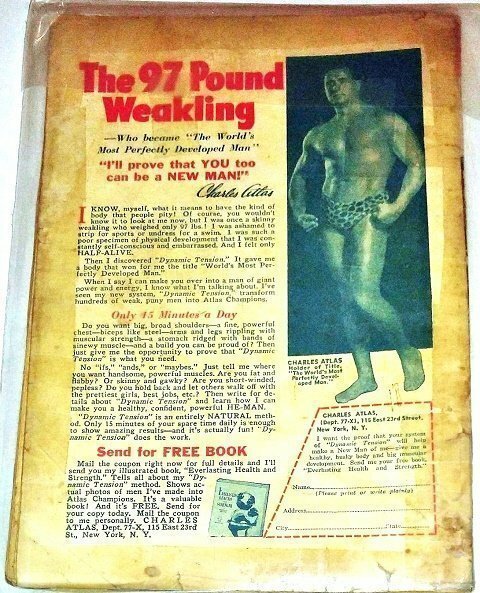 O.K., for $152.50 I see that the Back Cover has all 4 sides Taped about 2″ thick and dirty/stained, 1″X2″ Piece missing bottom left Front Cover, Tape on at least 3 sides of the Front Cover (Spine, and both sides), Date written “R 8/42”, “Chad” had a good read as he wrote his name large on the Front Cover; “H.R.” also enjoyed the issue with his/her smaller sized initials written at the left mid-spine, and a Dirty Front Cover. In other words the issue is pretty well trashed ! Curiouser and curiouser. 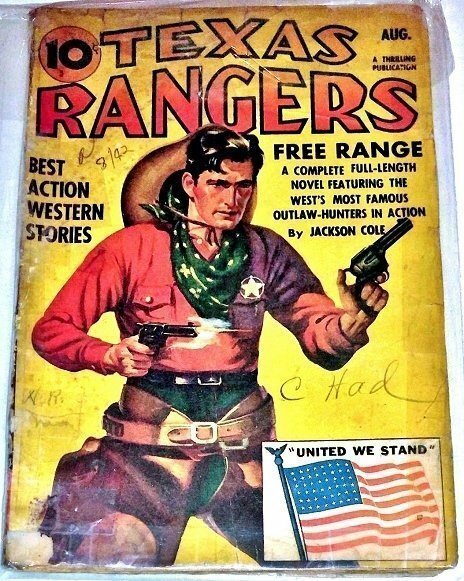 $152 is more than the very top condition for TEXAS RANGERS’ First Issue.